The Greek vessel ALMA. This appears to be her name taken from the bridge. RWJ? 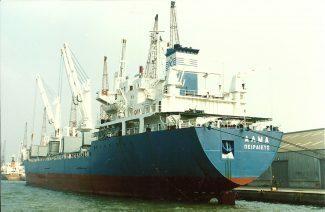 The larger-than-average general cargo vessel ALMA (11,584 tons gross; 18,020 deadweight) was built at Rio de Janeiro and completed in 1980. It was owned by International Oceanways Corp, of Panama, and under the Greek flag. Its manager was London-Greek outfit Seven Seas Maritime Ltd, whose principal was Stelios Kalamotus … hence the K on the funnel. Apart from temporarily taking on the name MALLECO in 1992-93 for a charter, ALMA kept her name and stayed with the same company until 2001, when she was sold to another Greek company and renamed SEA ATHINA. Three more names and three more owners later, she was broken up at Mumbai, India, in 2012 as BM ADVENTURE.